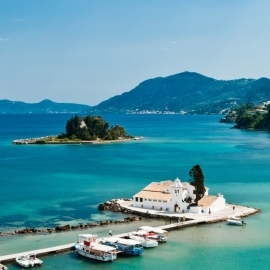 The first fortress (Fortezza) of Corfu stands on the east side of the Old Town. 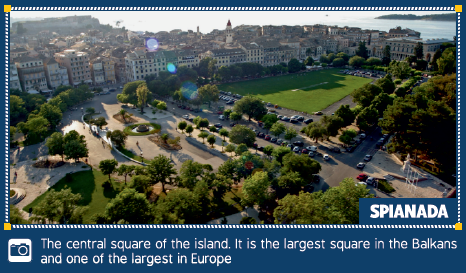 Today, the gate of the Fortress is just in front of the legendary Liston, in Spianada Square. In order to enter, the visitors must walk through the bridge over the artificial ditch, known as Kontra Fossa, which has turned the Old Fortress into an island. Inside the Old Fortress of Corfu there are imposing buildings which were constructed by the Venetians and the Englishmen to serve their military needs: one Venetian prison (1786), which was expanded from the Englishmen, two English barracks (1850) and a military hospital, which currently houses the music school. Moreover, inside the fortress you can visit the Doric church of St. George (1840). On the northern side of the Venetian citadel there is Mandraki, a small harbor full of ships and a safe anchorage for fishing boats. On the northern side of the peninsula the beautiful gate Soranza is found, while stone stairs lead to the upper level of the fortress where one can enjoy the panoramic view of Spianada, the Old Town, the bay of Garitsa and the island of Vido. In the outdoor space of the fortress, called Versiada, cultural events are currently hosted.